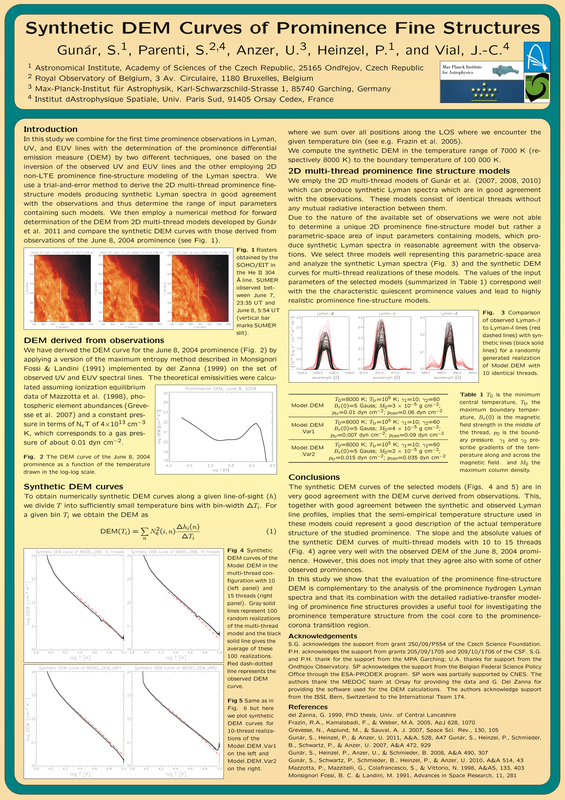 Abstract: We combine for the first time the hydrogen Lyman-line observations and modelling with the UV and EUV lines observations and the differential emission measure (DEM) determination for a prominence observed on June 8, 2004. We use a trial-and-error method to derive the 2D multi-thread prominence fine-structure models producing synthetic Lyman spectra in good agreement with the observations. We then employ a newly developed numerical method for the forward determination of the DEM from 2D multi-thread models and we compare the synthetic DEM curves with those derived from observations using inversion techniques. The available observations of the June 8, 2004 prominence allow us to determine the range of input parameters of the models producing synthetic Lyman spectra in good agreement with the observations. We select three models, which well represent this parametric-space area and compute the synthetic DEM curves for multi-thread realizations of these models. The so obtained DEM curves of the selected models very well agree with the DEM curves derived from the observations. We show that the evaluation of the prominence fine-structure DEM is complementary to the analysis of the prominence hydrogen Lyman spectra and that its combination with the detailed radiative-transfer modelling of prominence fine structure provides a useful tool for investigating the prominence temperature structure from the cool core to the prominence-corona transition region. This entry was posted in Conferences, My Publications and tagged Prominences, Research, Science, Solar Physics. Bookmark the permalink.